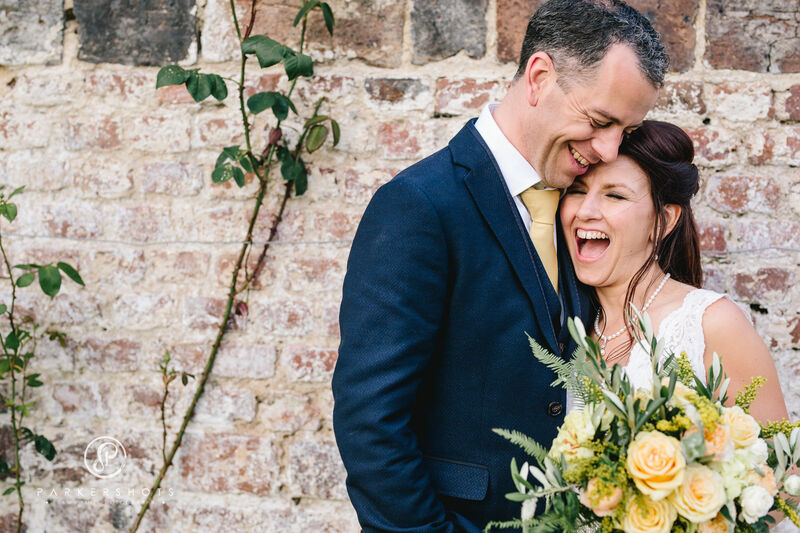 This beautiful couple got in touch just two months before their wedding date and I’m so pleased that we managed to pull this off in such a short space of time. To be fair, they had been kind of busy saving lives, him as a cardiologist and her as an intensive care nurse so the wedding plans had naturally taken a back seat. On our first meeting, we just clicked and I knew exactly what they wanted just from the one reference photo of a candelabra centrepiece that they showed me for inspiration. 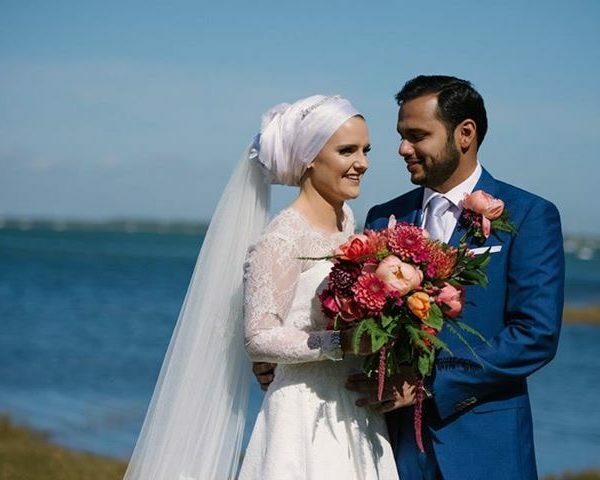 A riot of colour that would be symbolic of their two cultures and the union of their marriage. 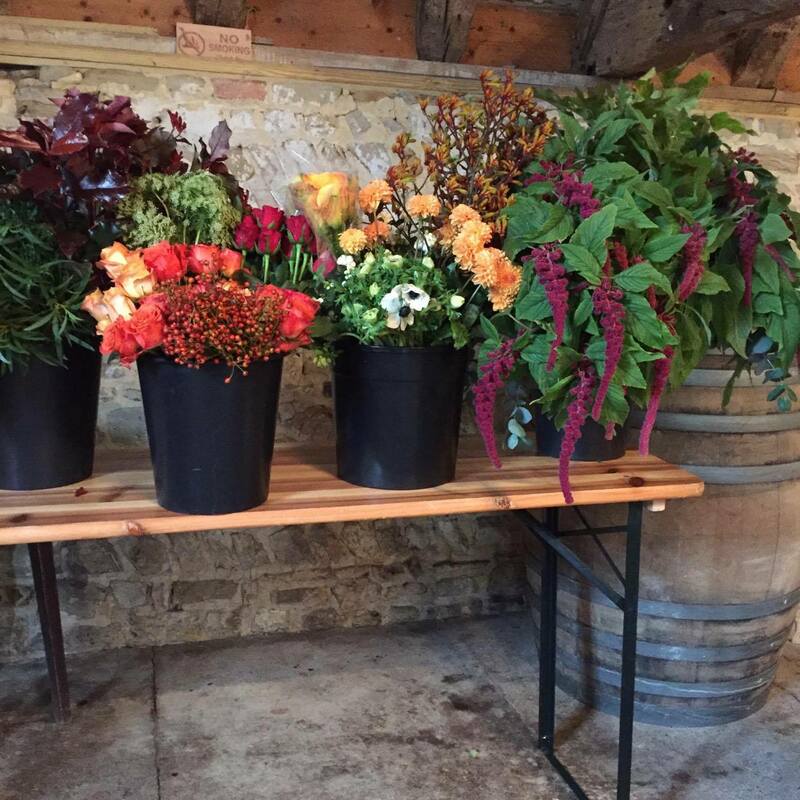 I chose clashing colours of hot pink, coral, orange, deep red and lime greens and a mix of more traditional wedding flowers (peonies, dahlias and tulips) with something a little more exotic (nutans, amaranthus and umbrella ferns). 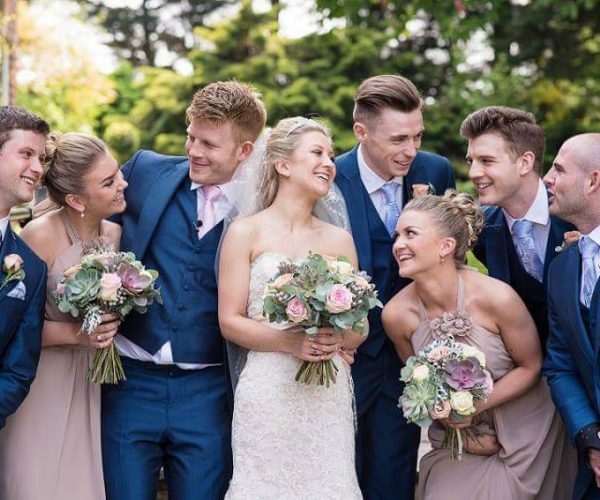 The couple were married in the magical grounds of Tournerbury Woods, a 50 acre estate with it’s own private beach. 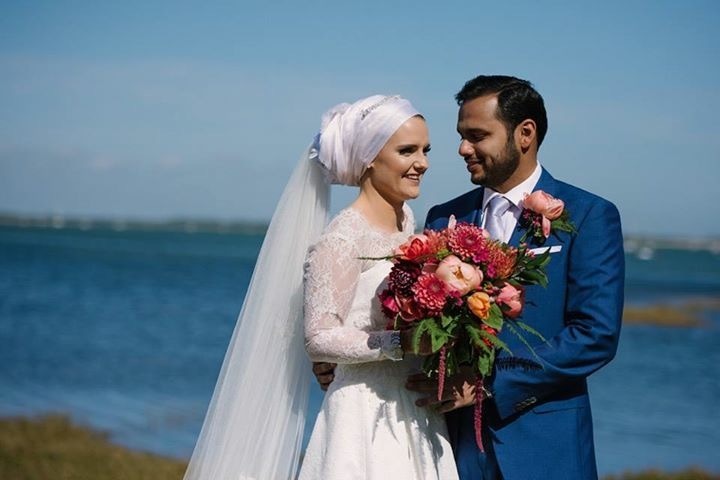 The day was split in three parts, with a traditional Irish ceremony by the waterfront, followed by a Muslim blessing in front of the gazebo followed by the wedding breakfast and dancing in the marquee. These fabulous photos and video of the celebrations were taken by the talented duo Oana and Valentin at Tell Your Story Photography & Film. And they really did tell the love story of Jemma & Sarosh. Well what else are you going to do on a rainy day in May than try and create a tropical paradise in the heart of the Sussex countryside? 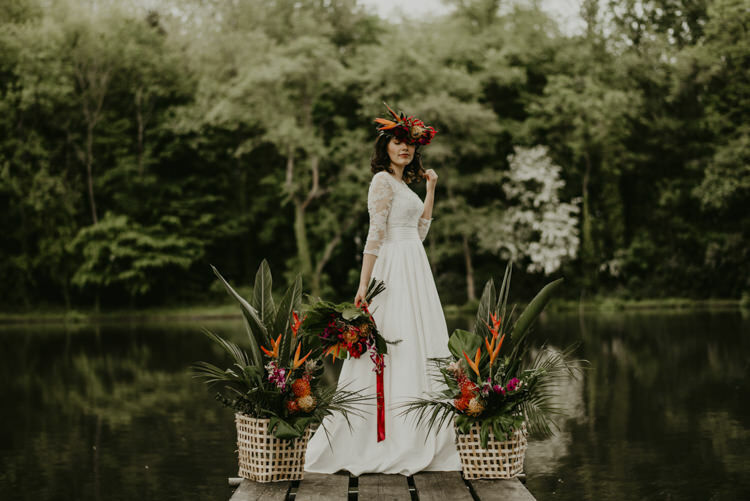 This photo shoot was a creative collaboration with other like minded wedding suppliers at the hidden gem of a venue, Decoy Ponds near Arundel. The owner Karen and her husband have been in residence for some 25 years, but it’s a relatively new venue, established after their daughters got married in the grounds of their stunning home. The beauty of this shoot was captured by the one and only Jacob Malinski who captures light like no other photographer. I want to personally thank him for the way that he managed to hero my flowers, oh and manage to take an off the cuff portrait of me….but more of that later. The shoot was organised by the indomitable Nicola Austin Weddings & Events. I met Nicky through a mutual friend and was really impressed by her organisational skills and ability to just get the job done. The brief was quite open but I knew I needed to include a mix of hot pinks and oranges so chose Heleconia, Gloriosa, Ginger Lily, Dendrobian Orchids, Nutans and Peonies with a mix of palms, ferns, monstera and banana leaves. I designed an unusual assymetric bouquet with trailing ribbons in complimentary colours. I also felt that this wedding style would lend itself to a heavier, opulent flower crown which is very on trend. (Fun Fact: The beautiful models Stephanie & Ben are actually a real life couple who recently got married themselves!!) Stephanie’s hair was created by the talented Glamour by Martine and her make up was by the formidable Olivia Agate. For the ceremony, I chose to decorate the beautiful birch arch hired from The Beautiful Day with tropical palms with went really well with the lush green foliages of the grounds. 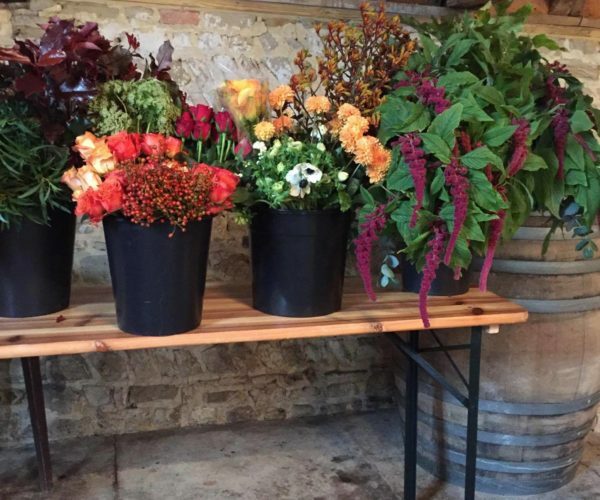 They also supplied the lovely vintage oak barrels on top of which I added pedestal arrangements. The beauty of these is that they can then be easily moved to the reception afterwards. Small sprays of tropical flowers then lined the aisle to carry the colours through the whole design. Again, these can be moved afterwards to the chairs at the top table. The exquisite marquee, handmade in nearby Chichester, supplied by Tents N Events provided the perfect canvas to the bold, bright colours. I really loved creating the hanging installation using a vintage ladder, palms and orchids. When the tent is this beautiful your guests really should be looking up! For the top table, I created a triptych of wooden woven baskets containing mini pineapples and bamboo amongst other tropical flowers. Bold, orange hemmed hessian runners made by Eloise at The Beautiful Day complimented these perfectly and I positioned Fatsia leaves on each place setting along with beautiful acrylic placecards handmade by You Make My Dreams. The tropical sunset inspired four tier wedding cake was created by Kasserina Cakes and it took pride of place in the marquee setting, ready to be cut by the bride and groom. 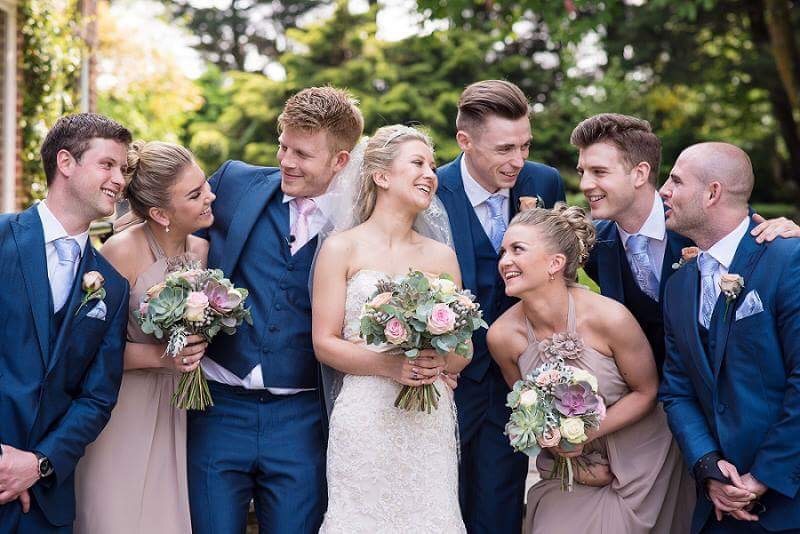 What a beautiful spring wedding this was set in the magical grounds of Great Fosters, a Grade One listed venue with some 50 acres of stunning gardens. I was introduced to Angela and Chris by the indomitable wedding planner Inspired By Susie Evans. 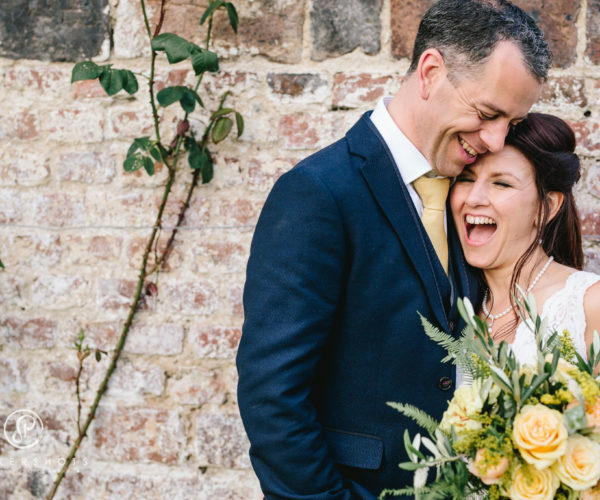 Susie knew that the flowers were central to the wedding theme and that she needed a a florist who could interpret the ‘Bright Spring Blooms’ brief and create natural seasonal wedding flowers with heaps of contrasting colours and textures. From our meeting, Angela and I just hit it off. She was such a sweetheart to work with and luckily for me knew so much about flowers. 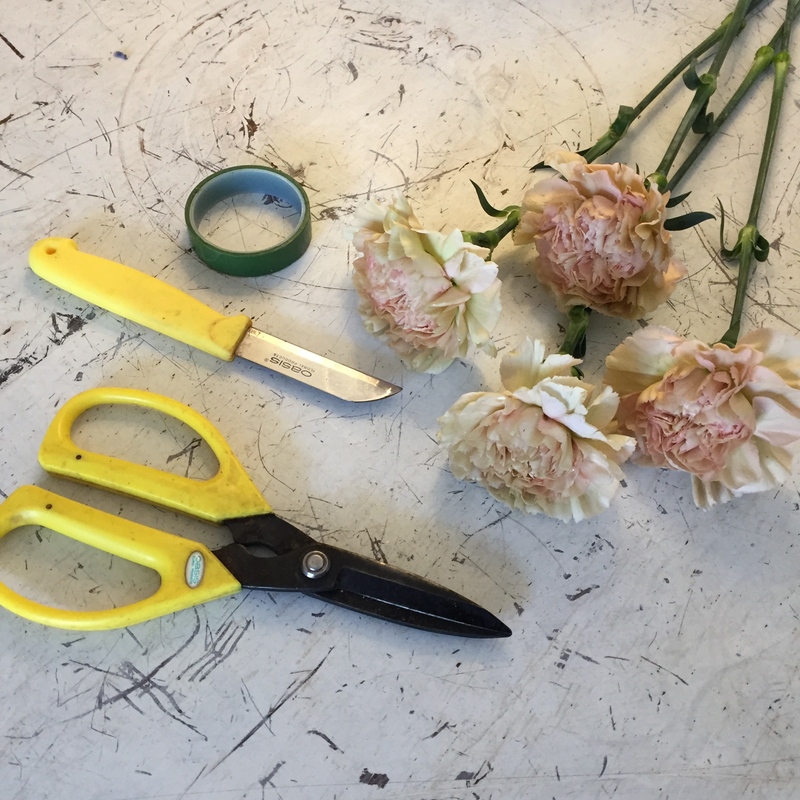 She definitely wanted to include Peonies, Garden Roses, Ranunculus and Lily of the Valley and together we finalised the selection based on colour, shape and texture. 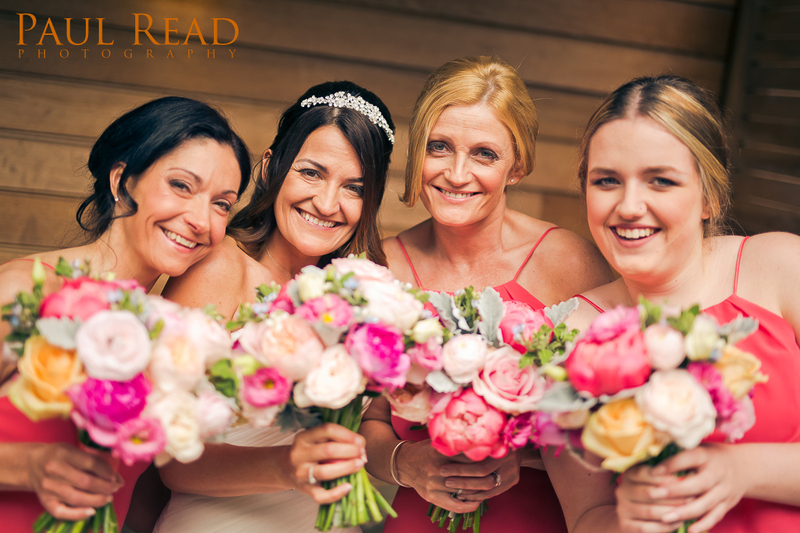 The wedding flowers were perfectly captured by the very talented Paul Read Photography and I want to personally thank him for letting me use these images on my blog. The reception drinks were held in the Painted Hall where guests could look at the fabulous ‘planted’ table plan using my vintage apple crates. Each of the tables was named after one of the featured flowers and Angela cleverly made all the table cards herself including the meaning of the flowers too. Such a sweet idea and it smelt divine! After champagne and canapes, guests then moved into the Tithe Barn for the wedding reception. Here I used a combination of high and low centrepieces to create the wow factor. The beautiful gold chiavari chairs were hired from Coordination Catering Hire and the fantastic lighting system was created by Creative Spark. Angela’s attention to detail was exemplary and she wanted the wedding cake to feature complimentary flowers so I liased direct with the amazingly talented Emma at Wicky Woo Woo Cakes. All the flowers were sugar crafted and handmade to perfection using the reference pictures I supplied. I just loved how Emma incorporated figures of Angela, Chris and their beloved terrier Frank too! 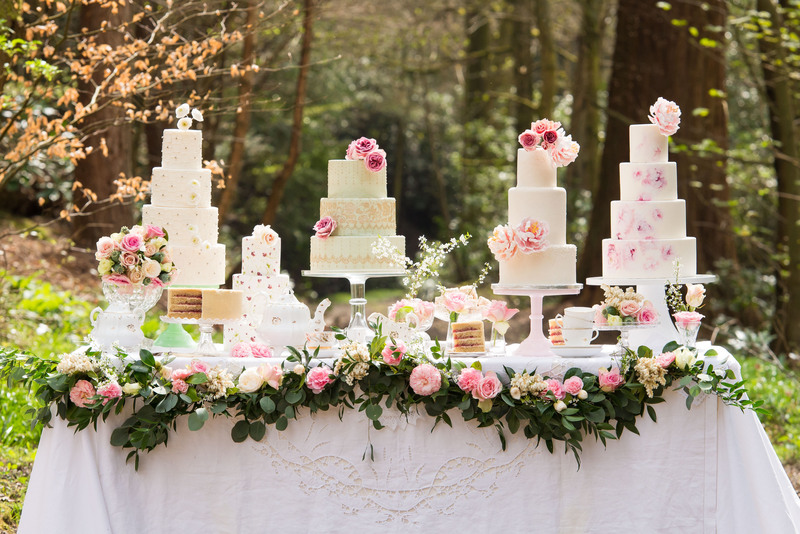 I was invited to take part in this promotional shoot for Nadya’s Cakes & Bakes in the grounds of The Chiddinglye Estate. There is so much lush woodland to choose from, we were spoilt for choice. We settled on the beautiful woods, just where the trees parted and the sunlight dappled the leaves and spread across the moss covered banks. Alex Rickard Photography took some stunning shots for Nadya and her fledgling business and we were all thrilled with the results. What do you think?